Barnacle cover at Shaws Cove has exhibited a general decline since initiation of monitoring in 1996. From 1996 to 1999, barnacle cover was high (above 70% of plot area, on average). From 2000 – 2007, barnacle cover was slightly lower, with cover rarely exceeding 70% of plot area on average. From 2007 – 2014, cover in barnacle plots consisted of approximately half bare rock and half barnacles. In these plots, most of the area not covered by barnacles is bare rock. Other species do occur in the plots at low abundance; for example, non-coralline crusts typically average less than 2% cover in these plots with a maximum of close to 7% average cover in Fall 2009. In fall of 1998, the red alga Endocladia encroached into barnacle plots with an average cover of ~2.5%; in subsequent seasons this alga was occasionally noted in barnacle plots but average cover never exceeded 1% . 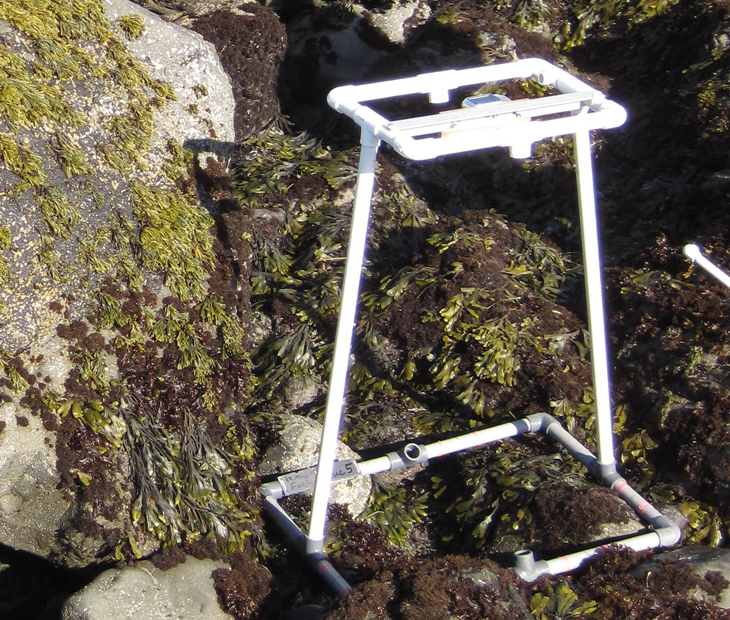 On rare occasions, recruitment of the brown alga Hesperophycus was observed but individuals typically died off before the next sampling period. Motile invertebrate surveys in barnacle plots recorded high numbers of Littorina spp. and variable numbers of small limpets. As in other sites in this region, mussel cover at Shaws Cove remained relatively static from Fall 1996 through Fall 1997, but cover declined during the 1997-1998 El Niño. During this period of lowered mussel cover, a moderate amount of bare rock cover was recorded in the plots, along with small abundances of barnacles, crustose corallines, articulated corallines, and non-coralline crusts. From 1998 to 2006, mussel cover steadily increased. The largest increase in cover was observed in fall 2003 (increase of 20% cover on average from the previous sampling period) as gaps within the mussel plots were filled with adult mussels (recruitment did not appear to play a role). In spring 2007, following a storm accompanied by large waves, we observed approximately 35% loss in average cover at the site, but the patchy nature of the disturbance resulted in 2 plots being almost completely denuded of mussels while other plots remained undisturbed. In disturbed plots, there was an increase in cover of the ephemeral alga Ulva in fall 2007 followed by a steady increase of barnacles which replaced Ulva in 2008 and 2009. After the drop in mussel cover in 2007, mean cover remained relatively constant for three years before increasing again in 2010. Since Fall 2012, mussel cover declined at the site, dropping below 50% average cover for the first time since sampling was started at this location. Although the beginning of the mussel decline occurred during a period of increased sea star (Pisaster) abundance at the location, the decline in mussel cover continued following a drop in sea star numbers. The area previously occupied by mussels in this recent decline most commonly remained as bare rock, while low abundances of barnacles (Chthamalus, Balanus, and Tetraclita) and articulated corallines were found in some plots. Motile invertebrate counts were dominated by limpets, showing a seasonal pattern of higher counts in the fall sampling period. This pattern is not evident starting in 2012 after which sampling only occurred during the spring sampling periods. Rockweeds at Shaws Cove exhibited typical variations in cover within and across years with a pattern of higher cover in the fall than in the spring sampling periods. Starting in 2004 there was a minor but steady decline in average rockweed cover, driven in part by a sharp decline in cover in a single plot in which rockweeds were completely absent by Fall 2008. Cover remained low in that plot through 2010, and as cover in that plot increased average abundance of Silvetia in the monitoring plots also increased to levels similar to those recorded pre-2004, exceeding 70% of plot area after Fall 2011. When Silvetia cover was low in the plots, most of the plot area was bare rock, although we also observed low cover of crustose algae, the red alga Caulacanthus, articulated corallines, and mussels Motile invertebrate counts were dominated by Littorina spp. and limpets that have remained mostly consistent over time. Chitons, turban snails, and hermit crabs are also consistently found in plots, with variable but low numbers over the years. Abundance of the red alga Endocladia (turfweed) has varied greatly (from an average of 7 to 52% cover) at Shaws Cove since initiation of monitoring in 1996. The period with the highest cover occurred between spring 2001 and spring 2003 with cover values between 40 and 50%. Large losses (~20% cover) occurred in fall 2000, fall 2003, and fall 2007. Bleaching seems to have caused the largest loss of cover in 2003 as observers noted damaged thalli, and large portions of the turfweed were gone by the next sampling period. In fall 2007, cover reached a low of 7%, and after a moderate increase in cover from 2008 – 2012, cover declined again in Spring 2012 and remained low (under 20% of plot area on average) through 2014. In addition to Endocladia, bare rock and barnacles contributed to overall cover in these plots. Like Endocladia, recorded cover of bare rock and barnacles was highly variable over the years. Barnacle cover, on average, hovered around 30% with peaks above 50% cover in fall 1997, spring 2006, and Spring. Rockweed cover in Endocladia plots was relatively low from 1996 to spring 2003 but increased from fall 2003 to fall 2006, reaching a peak of 20% in fall 2004. Most of this change was driven by a dramatic increase in cover in two plots in 2004 (which were located adjacent to the rockweed bed). Rockweed cover dropped again and has not exceeded 3% of plot area on average since 2007. Motile invertebrate counts were dominated by Littorina spp. and limpets with numbers remaining relatively stable over the years. Rock plots were established at this site in Fall 2011 in areas above the barnacle zone. In general cover of these plots consisted mostly of bare rock. Motile invertebrate counts within rock plots consisted primary of moderately high numbers of Littorina snails. Sea Star (Pisaster) counts are taken over the entire site at Shaws Cove. 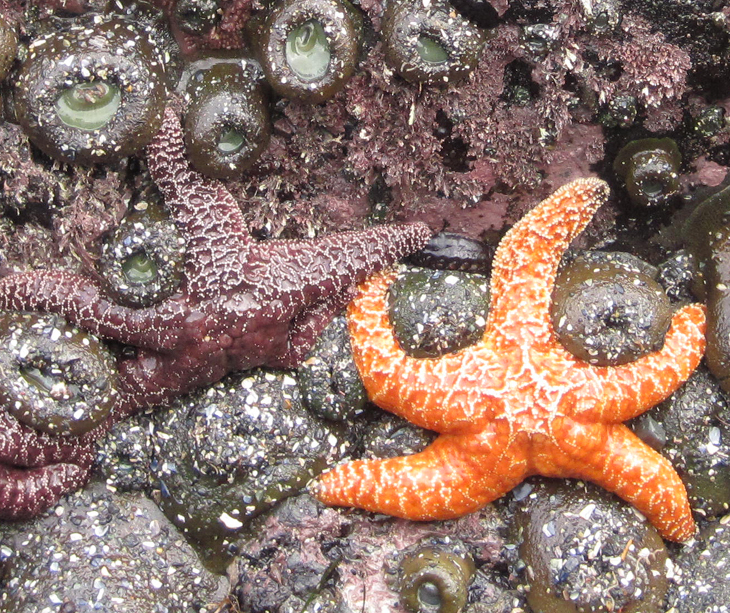 Sea star numbers varied greatly over the sampling period. For most of the sampling period, fewer than 60 individuals were counted in each survey, with occasional peaks of high abundance (in 2004, 2006, and 2008-2009) of approximately 100 individuals per survey. Increasing numbers of sea stars were encountered at the site between 2010 and 2012, with more dramatic increases noted in late 2012 and early 2013. In Fall 2013, abundances peaked at approximately 400 individuals. In this Fall 2013 survey, no signs of sea star wasting syndrome were noted, although symptoms were observed in seastars at nearby Orange County sites a few days after the Shaws Cove survey had been completed. In Spring 2014, no Pisaster were observed at this site; Sea Star Wasting Syndrome is a likely contributor to this sharp decline. Sea star sizes were consistently measured starting in Spring 2012. 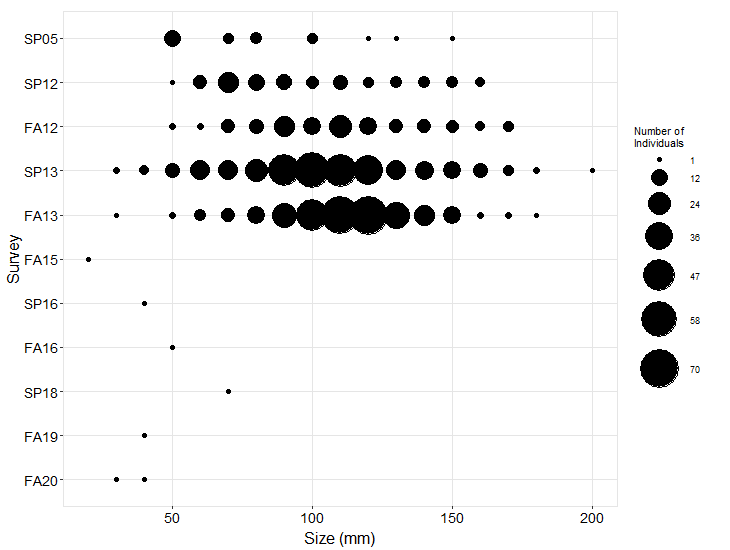 Most individuals fell in the 80-130 mm size class.